Oriental Lilies are the classic “late bloomer”. These stunning flowering bulbs bloom after Asiatic Lilies, continuing the Lily parade in the landscape well into the season. Growing Oriental Lilies is fairly easy provided you have a well prepared site for bulbs, plenty of sun and good drainage. Some of the most magnificent flowers in the Lily family are in this large group of species and cultivars. 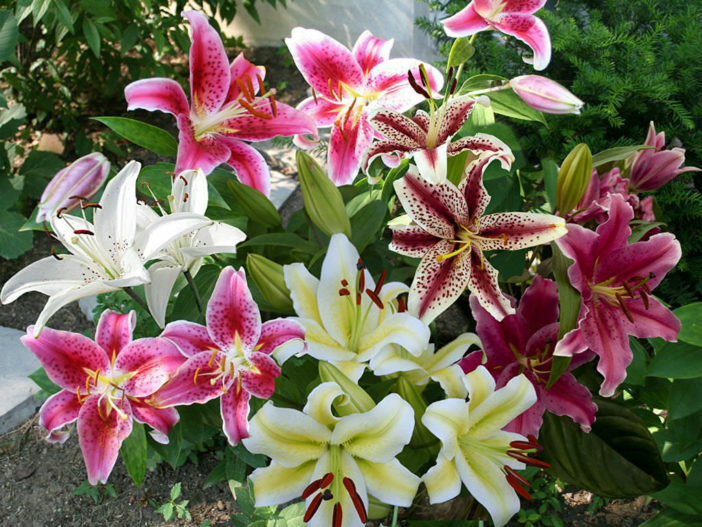 Asiatic and Oriental are two of the most popular forms of True Lilies available. Asiatic Lilies bloom in June to July while Oriental bulbs start to appear in August. Both are quite easy to grow with thick, rigid stems, strappy leaves and showy flowers. Oriental Lily cultivars, however, tend to have larger flowers. Orientals also thrive in cooler regions and can tolerate less than ideal soil conditions. To answer the question “what is an Oriental Lily”, we first need to concede what a True Lily is. There are many flowering plants referred to as Lilies, but only True Lilies are in the genus Lilium. They spring from bulbs with scales on the exterior and no protective skin. Oriental Lilies are larger than their Asian counterpart and very fragrant, making them popular additions to the cut flower garden. Many Oriental Lilies may grow 3 to 6 feet (0.9 to 1.8 m) in height, much taller than Asiatic Lilies. Site selection is the most important aspect when planting an Oriental Lily. Choose a location that is in full sun when growing Oriental Lilies. These bulbs cannot tolerate boggy soil, which means their planting bed should be tested for drainage and amended prior to installing the bulbs. Incorporate organic material into clay soils to increase drainage and nutrients. Oriental Lilies are available either in fall or in spring. Wait to plant until spring in areas with sustained freezes. Install bulbs 4 to 6 inches (10 to 15 cm) deep with the pointed part upward. Orientation is very important when planting an Oriental Lily. Some gardeners swear by the addition of some bone meal at planting, but this isn’t strictly necessary. That said, it will not hurt anything to do so. Bulbs should sprout and bloom the first year. Bulbs can withstand quite a bit of crowding and can be installed in containers too. Lilies are one of the easiest plants to care for unless you live in a deer prone area, since those browsing animals seem to find lily bulbs as attractive as candy. Once bulbs bloom, keep them moderately moist. When blooms are spent, cut off flower stalks but allow foliage to remain until yellow and beginning to die. This will help fuel the bulb for the next year’s bloom. In fall, mulch over the area with a few inches of organic bark mulch. Pull away in spring as soon as you begin to see sprouts. Fertilize bulbs once annually in spring with a good slow release fertilizer. Once every 3 or so years, dig up the clusters of bulbs and divide them to increase plants and enhance flowers. If blooms are excessively large and begin to flop over, threatening the stem, simply stake them up until flowers are spent. Oriental lily plant care is one of the most straightforward. Northern gardeners use caution. If a harsh winter is expected, it might be best to dig up your bulbs and store them indoors, replanting them in spring.